The Leyland PD3 and AEC Swift await departure from Blundell Street on the free heritage bus tours. The PD3 features translucent roof panels. Full contravision advertising features on many of the East Lancs bodied vehicles used on the Promenade service including this 2006 ADL Trident. Blackpool Transport’s latest vehicles are the Palladium branded Mercedes-Benz Citaros. The Lancastrian Transport Trust’s restored Blackpool Atlantean arrives on the Promenade whilst working Catch 22’s Zoo service. In 1885, Blackpool became the first UK borough to feature electrically powered street transport. A privately operated Promenade tramway replaced a horse bus service that had been introduced on the then newly created thoroughfare some 15 years previously. Blackpool Corporation later acquired the tramway and expanded it to many of the major thoroughfares in the Borough. It was 1921 before the Corporation ventured into motor buses, albeit outside the Borough boundary, the first town service starting the following year. Bus services expanded significantly with the Borough’s growth during the late 1920s and 1930s. Some inland tram routes were replaced by buses in the late 1930s but it was 1962 before the bus reigned supreme on all but the Promenade. 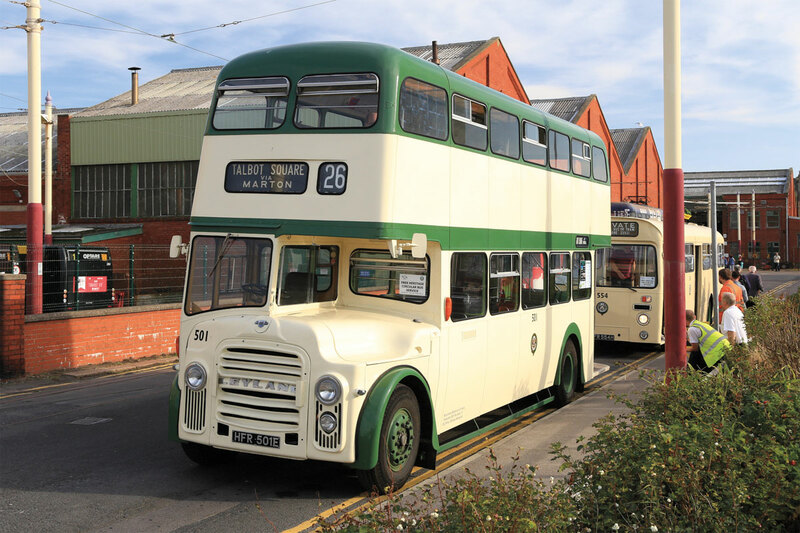 A distinct Blackpool style of streamlined bus was evolved in the 1930s under the leadership of Manager Walter Luff creating a harmonious image of bus and tram. It was fitting therefore that heritage buses featured in the festivities to celebrate 130 years of tramways in the Borough. Privately owned vehicles with Blackpool connections operated a 15 minute frequency free service from outside Blackpool Transport headquarters in Blundell Street. The service followed the routes of the final two inland tramway routes to be abandoned in the early 1960s, along Lytham Road to the new light rail depot at Starr Gate, past the Pleasure Beach and round a circular route through the suburb of Marton. Arriving in Blackpool late on the second day of the event, it was appropriate to find a Metro-Cammell bodied Leyland PD3 ready to leave on the day’s penultimate departure, as earlier versions of the PD3 had replaced the trams on the routes covered. Although lightly loaded for this run, the crew advised that the service had generated considerable interest throughout the event. The bus was one of 40 similar vehicles bought to update the fleet in 1967/8, one of the last major deliveries of open platform double-deckers in the UK. 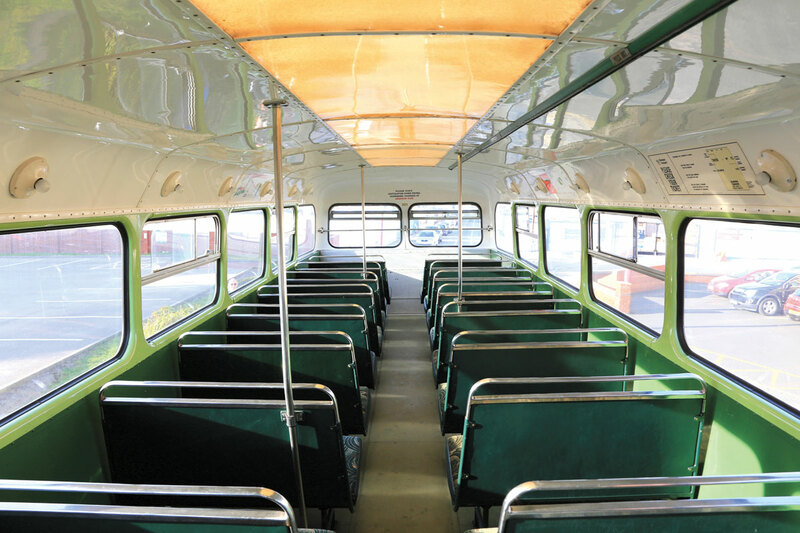 Although traditional in layout, the bodies included some modern features including translucent panels in the ceilings, a feature noted on Lothian’s latest Gemini 3s the previous day! The performance of the nearly unladen PD3 was lively but tempered by the need to negotiate gingerly the many speed humps and raised platforms which have been installed across Blackpool’s roads over recent years. 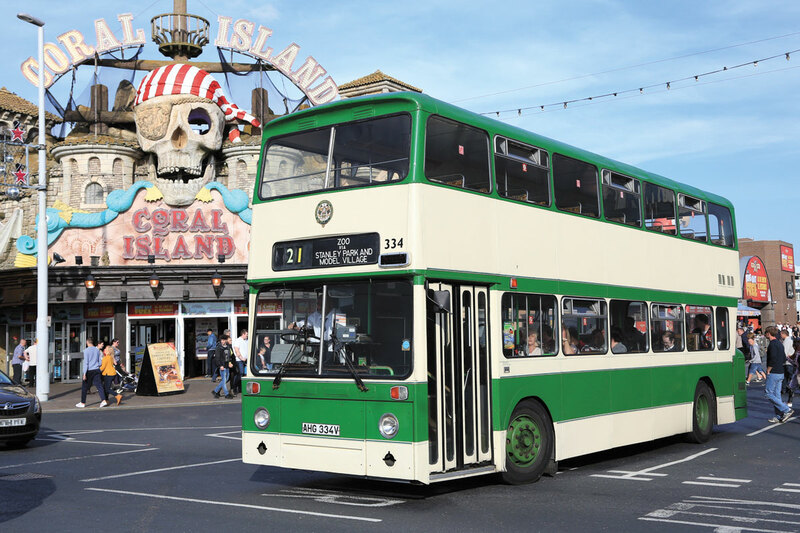 Sharing duties with the PD3 were a Blackpool Marshall bodied AEC Swift single-decker only two years younger and a Leyland Atlantean in Barrow colours. 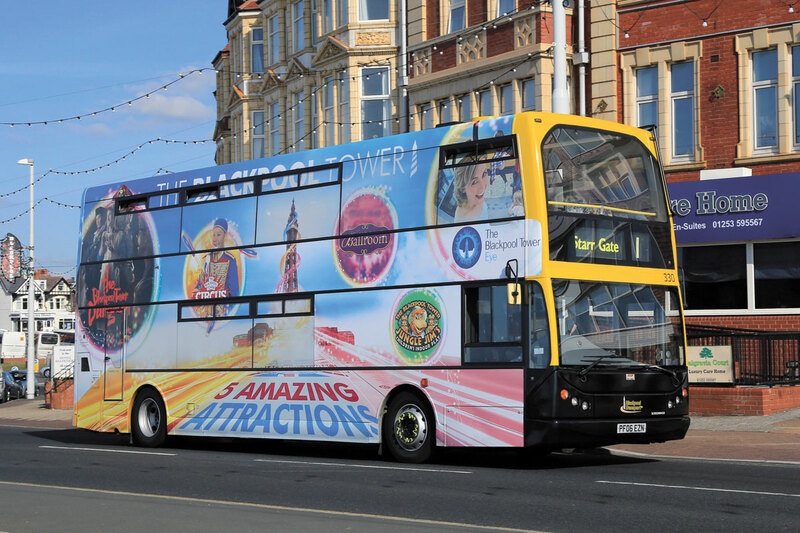 Blackpool Transport’s current operation still covers all the roads traversed during the heritage tour and also includes a frequent service of double-deckers parallel to the upgraded Promenade light rail route. The East Lancs bodied vehicles used date from the early 2000s and many are wrapped in full contravision vinyl. It is popular with holders of non Blackpool English travel passes which are not valid on the trams and faces competition from Catch 22 operating former Cardiff Transport Dart SLFs. 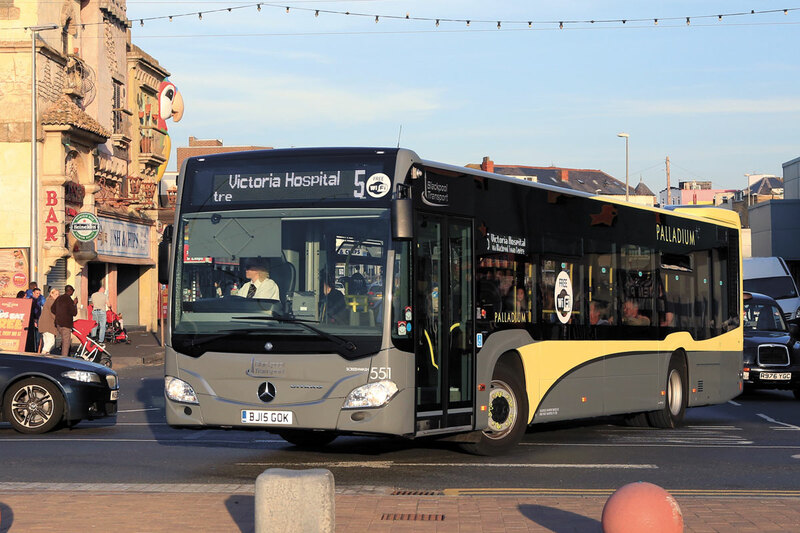 Recent investment by Blackpool Transport has seen the introduction of high specification Mercedes-Benz Citaros on service 5, the route of which partly follows the Lytham Road tramway. Catch 22 also operate a heritage service to Blackpool Zoo, sub contracted to Nuttalls Coaches using Lancastrian Transport Trust vehicles.